Most of the important things in the world have been accomplished by people who have kept on trying when there seemed to be no hope at all.” Dale Carnegie. 2 50th Celebration Day! It was wonderful to celebrate our special day with the community. The children enjoyed their picnics, celebration cakes, photos and of course the bouncy castles! Many school governors and past pupils joined us for the day and we heard memories from Jean Garner (Chair of Governors) and others. 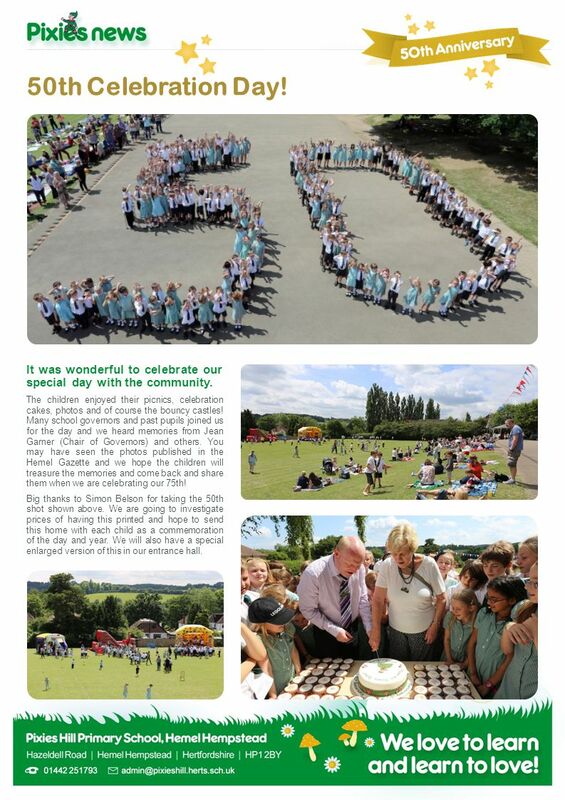 You may have seen the photos published in the Hemel Gazette and we hope the children will treasure the memories and come back and share them when we are celebrating our 75th! Big thanks to Simon Belson for taking the 50th shot shown above. We are going to investigate prices of having this printed and hope to send this home with each child as a commemoration of the day and year. We will also have a special enlarged version of this in our entrance hall. 3 Week of 06/06/14 Reception: Mia Okander Year 1: Phoebe Whiteman Year 2: Samuel Brinklow Year 3: Matthew Conlon Year 4: Nicole Johnson Year 5: Ben Smith Year 6: Class at Rock UK Week of 13/06/14 Reception: Alfie Surety Year 1: Ella Smith Year 2: Daniel Martinez-Wise Year 3: Charlie Carroll Year 4: Joshua Harpley Year 5: Pippa Marchant Year 6: Lois Axten & Chloe Pickett Week of 20/06/14 Reception: William Morgan Year 1: Finley Smart Year 2: Jack Lee Year 3: Tyler McAuliffe Year 4: Aiden Dabare Year 5: Alfie Brown Year 6: Oliver Marchant Week of 27/06/14 Reception: Ava-Lee Sarosh-White Year 1: Jayden Harry Year 2: Francesco Oliver Year 3: Ryan Pearce Year 4: Jude Tate Year 5: Muneeb Usman Year 6: Oliver Pleece Stars of the week to everyone! Well done News in brief Taekwondo club to be run as a lunch time club. Details on this available soon. Children will meet their new class teacher after the Y2 class assembly on July 3rd for the morning. New clubs starting next year – Environmental, Choir and Astronomy. 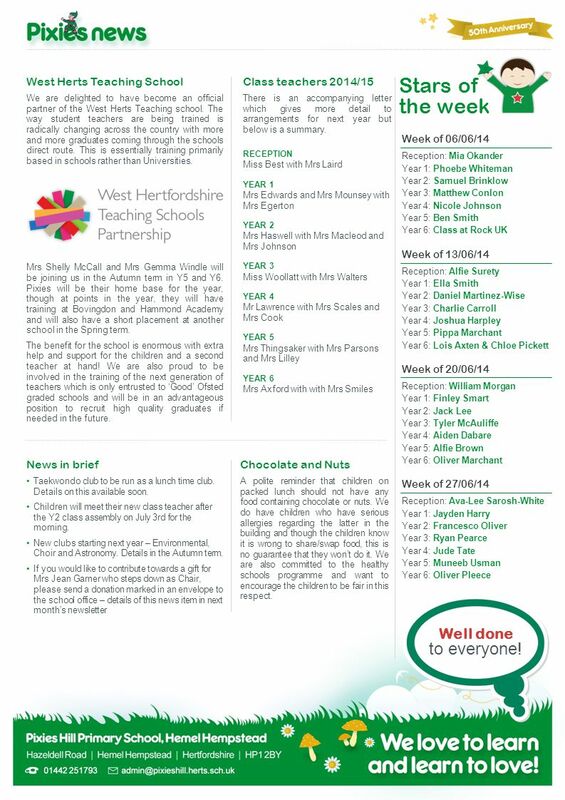 Details in the Autumn term. If you would like to contribute towards a gift for Mrs Jean Garner who steps down as Chair, please send a donation marked in an envelope to the school office – details of this news item in next month’s newsletter Class teachers 2014/15 There is an accompanying letter which gives more detail to arrangements for next year but below is a summary. RECEPTION Miss Best with Mrs Laird YEAR 1 Mrs Edwards and Mrs Mounsey with Mrs Egerton YEAR 2 Mrs Haswell with Mrs Macleod and Mrs Johnson YEAR 3 Miss Woollatt with Mrs Walters YEAR 4 Mr Lawrence with Mrs Scales and Mrs Cook YEAR 5 Mrs Thingsaker with Mrs Parsons and Mrs Lilley YEAR 6 Mrs Axford with with Mrs Smiles West Herts Teaching School We are delighted to have become an official partner of the West Herts Teaching school. The way student teachers are being trained is radically changing across the country with more and more graduates coming through the schools direct route. This is essentially training primarily based in schools rather than Universities. Mrs Shelly McCall and Mrs Gemma Windle will be joining us in the Autumn term in Y5 and Y6. Pixies will be their home base for the year, though at points in the year, they will have training at Bovingdon and Hammond Academy and will also have a short placement at another school in the Spring term. The benefit for the school is enormous with extra help and support for the children and a second teacher at hand! We are also proud to be involved in the training of the next generation of teachers which is only entrusted to ‘Good’ Ofsted graded schools and will be in an advantageous position to recruit high quality graduates if needed in the future. Chocolate and Nuts A polite reminder that children on packed lunch should not have any food containing chocolate or nuts. We do have children who have serious allergies regarding the latter in the building and though the children know it is wrong to share/swap food, this is no guarantee that they won’t do it. We are also committed to the healthy schools programme and want to encourage the children to be fair in this respect. Download ppt "Most of the important things in the world have been accomplished by people who have kept on trying when there seemed to be no hope at all.” Dale Carnegie." Humility is not thinking less of yourself, it is thinking of yourself less. C.S.Lewis Following on from last year’s entrance hall piece on values, we are. Kindness, books & progress! There is a strong link between reading and writing. One of the activities on our school improvement plan has been to encourage. Music, Trips and Sunshine! We’ve been having a think about how we raise the profile and prominence of music in the school and are about to trial a fantastic. If you say you can or you can’t you are right either way! Henry Ford Competition Winners A big well done to Reception Class who managed to find time to. All the very best Year 6 – We will miss you! We are very proud of our Year 6 class who are multi-talented and have provided us with many wonderful memories. The price of greatness is ‘Responsibility’ (Winston Churchill) We have really missed the Year 6s this week but they haven’t had much time to miss us! Daily. 68 Please turn over As we come to the end of a very busy term our KS2 children have been busily rehearsing for the end of school performance. No 13 23rd April 2010 Dear Parents/ Carers Welcome back to the new term. I hope you all had a lovely holiday with the children and that they have returned. No 10 5 th March 2010 Dear Parents/ Carers It seem the weather has brightened up and made us all feel cheerful. The end of term is fast approaching and. Welcome to St Mary’s New Parent’s Meeting May 13th 2015. Mon 2nd Mar | 3.30pm Open Classrooms Tues 3rd Mar | 3.30pm – 5.30pm Reception Parents Evening Wed 4th Mar | 4.30pm – 7pm Reception Parents Evening Thurs. 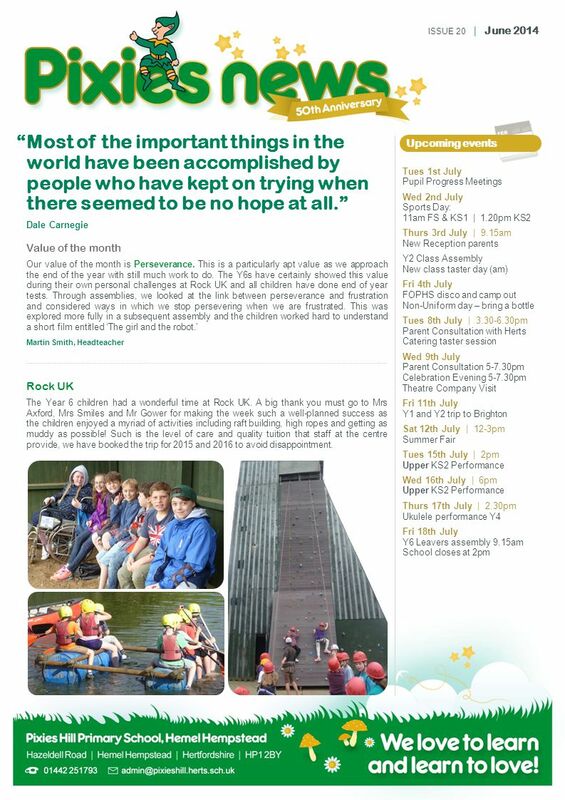 1 Highley Primary School Newsletter Grasmere Drive, Highley, Shropshire, WV16 6EH. I learned that courage was not the absence of fear, but the triumph over it. Nelson Mandela Anti-Bullying Week The school council put together a programme. Wed 1st July | 11am KS1 Sports Day Wed 1st July | 1.20pm KS2 Sports Day Thurs 2nd July Class Transition Morning Thurs 2nd July | 9am New Reception Parents. No 9 10 th February 2010 Dear Parents/ Carers Here we are at the end of another busy half term. The children and staff have worked hard and so I think. Thur 2nd Oct School Photos (individual and sibling) Fri 3rd Oct FOPHS film night Mon 6th Oct | 3.30pm Open Classrooms Wed 8th Oct | 9.15am KS1 Harvest. Contact Numbers During sessions: Out of hours : Achievement Wall Our achievement wall is located. Welcome to Bill Quay Primary School. OUR VISION At Bill Quay Primary School, we provide an exciting and challenging environment in which all children. Thornhill School News Issue 18 Fri 10 th February CLASS3CLASS3 CLASS ONE CLASS TWO SCHOOLSCHOOL Next week: Half Term Firstly a big Thank you to those of.